Bruxism is a very common condition better known as Tooth Grinding. There are about 30 million people in United States who suffer from bruxism. 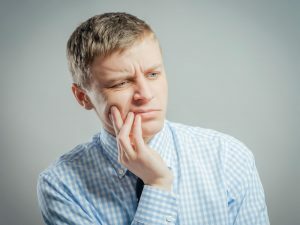 While many people wouldn’t think this is of any concern, even thinking it is only an annoying habit, the effects on your oral health can be very problematic and even devastating. Sometimes you wont even realize you are clenching or grinding your teeth until your mouth and face muscles start to hurt. This doesn’t exclusively happen when asleep, but it can also happen while awake if you are under stress. Anxiety is a big factor on bruxism. One of the first signs of bruxism is waking up with a morning headache or in your jaw joints. Your teeth might feel too sensitive. If you are sharing a bedroom with someone, they might also get awoken by the sound of your teeth grinding. If you realize you have bruxism you should go immediately to your dentists to see what are your options. Otherwise, ignoring this condition can lead to many oral complications like cracked teeth, gum inflammation, bone resorption, muscle, facial pain and much more. The grinding could affect the enamel of your teeth and make it easier to develop cavities so you will want to address it as quickly as possible. There are ways to combat bruxism. If the dentist realizes this might be a reaction to stress, a dental guards could be enough while you sort-out your situation. The dentists could additional prescribe a muscle relaxant but that depends on the case.